On the 26th of August 1910 in Leiden, Sigmund Freud and Gustav Mahler met for four hours. Love, Genius and a Walk imagines what they might have said. For classical music buffs, their chat is a tantalising opportunity to get under Mahler's skin in the year before he died. We know he was having marital problems relating to his young wife Alma, we know he was working hard on his (never completed) Symphony No. 10, and we know that afterwards, he was quite a different man. This conversation is at the core of Gay Walley's play and comprises much of the final act. The rest of the play tries to get under the skin of Gustav's marriage with Alma, which includes a passionate affair with Walter Gropius (who would go on to found the hugely influential Bauhaus school). All that is bookended by the marital problems of a contemporary couple in New York. He's a Wall Street risk manager / she's an unsuccessful but well-regarded author who is currently researching Mahler. Writing a play about geniuses is never easy (for obvious reasons), and Love, Genius and a Walk struggles to convince. The act of Mahler's composition - which to me seems like one of his core elements - is reduced to him hunched over a desk occasionally. A little more egregiously we're constantly told but not shown how great his music is. There are frequent scenes in which it's breathlessly communicated how he plumbs the depths of human emotion, but we only actually get to hear a very short excerpt as the play finishes. Freud doesn't fare much better - feeling like an aphorism-machine rather than a three-dimensional character. It's a bit weird when the Freud in Bill and Ted's Excellent Adventure is a more believable version of the man, but heyo. Despite all that, Lloyd Morris and Brendan Wyer are decent enough actors and the conversation the play centres on works well enough. Their moments together are easily the best bits of the play. If the play had 'just' dramatised their conversation that might have been enough. Let's just say it's difficult to care about characters' problems when you're imagining them blindfolded, stood against a concrete wall and being offered a last cigarette. While the core idea of imagining what Mahler and Freud discussed is fine, I simply didn't enjoy Love, Genius & A Walk. It's over-long, pretty damn boring and, as a singer-who-now-shall-not-be-named once wailed: "it says nothing to me about my life." I suspect it won't say much to you either. 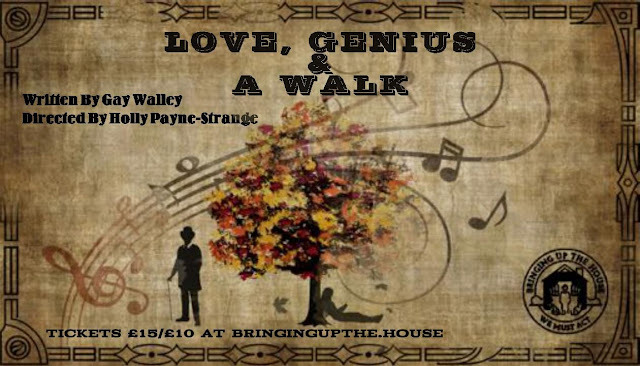 Love, Genius & A Walk was at the Drayton Arms Theatre on 7-8 October 2018.